All transactions are safe and secure with a reliable history in online purchasing behind each of our associates. 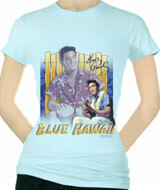 Buy the Elvis Blue Hawaii t-shirt to own Elvis clothing and merchandise. What is your favorite Elvis DVD? If it his movie Blue Hawaii then you are in luck because you have just discovered the perfect Elvis shirt for yourself. Whether you like it because of the breathtaking beach scenes, The King in a swim suit or simply his superb singing skills, you won't be let down. This Elvis Blue Hawaii t-shirt is available in men and women's styles you'll love. Rock-A-Hula Baby! Check out other exciting Elvis merchandise including Elvis wigs and sunglasses. In addition to the Elvis Blue Hawaii tee above, browse the Elvis Clothing Gallery for more apparel like men's and women's clothes, kids shirts or hoodies.